Kenya plans hero's welcome for million-dollar Global Teachers laureate. Kenya is planning a hero's welcome for a prodigal monk who made history on Sunday by becoming the first African to win the best teacher in the world prize worth one million dollars. Peter Tabichi is a Mathematics and Physics lecturer at the overcrowded Keriko Mixed Day Secondary School in Pwani Village, Nakuru County. He was already a human saint in his country after deciding to give away 80 per cent of his pay to support his pupils too poor to afford uniforms or books. A member of the Catholic religious order founded by St Francis of Assisi in the 13th Century, Tabichi reportedly beat nine other contestants to win the Varkey Foundation's competition which attracted over 10,000 applicants from 179 countries around the world. Organizers announced that Peter Tabichi emerged victorious as a result of his pioneering experiment of integrating ICT (Information and Communication Technologies) into 80 per cent of his lessons, along with science quizzes, low-cost apparatus and peer-to-peer learning. Rita Damary is a correspondent with Kenya's Star newspaper in Nakuru and one of the journalists covering the story making headlines in all the Kenyan media outlets. She told RFI that wild celebrations erupted in the remote Keriko Mixed Day Secondary School and Pwani Village after news of the award reached the community. Damary says the people of the remote district are mobilizing to welcome Tabichi when he returns from Dubai. 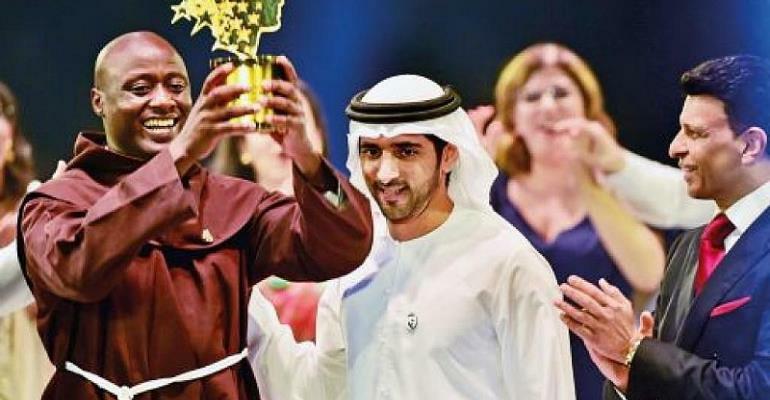 Aged just 36, Peter Tabichi said he was just trying his luck when applying for theWhile accepting the prize at the Dubai ceremony on Sunday, the monk admitted he was there because of what his students have achieved. “This prize gives them a chance and tells the world that they can do anything", he noted. Peter Tabichi also explained that “as a teacher who works on the front line, he had seen the promise of its young people their curiosity, talent, their intelligence and their belief". "Africa's young people will no longer be held back by low expectations. Africa will produce scientists, engineers, entrepreneurs whose names will be one day famous in every corner of the world. "Girls will be a huge part of this story," he added. Speculation is rife in Kenya about what Peter Tabichi plans to do with his prize money. The Kenya Star's correspondent in Nakuru reports that the people of Pwani want him to spend the money on more classrooms and recreational facilities for the school and to acquire buses for the children of Keriko some of who trek up to 10 kms every day to go to school.